This diagram shows the basic structure of the SS7 control signaling system. This diagram shows that a customer's telephone is connected to a local switch end office (EO). The service switching point (SSP) is part of the EO and it converts dialed digits and other signaling indicators (e.g. off-hook answer) to SS7 signaling messages. The SS7 network routes the control packet to its destination using its own signal transfer point (STP) data packet switches using separate interconnection lines. In some cases, when additional services are provided, service control point (SCP) databases are used to process requests for advanced telephone services. This diagram also shows that the connections used for signaling are different than the voice connections. This diagram shows that there are multiple redundant links between switches, switching points, and network databases to help ensure the reliability of the telephone network. The links between points in the SS7 system have different functions and message structures. Access links (A-links) are used for access control between EOs and SCPs. Bridge links (B-links), cross links (C-links), and diagonal links (D-links) interconnect STPs. 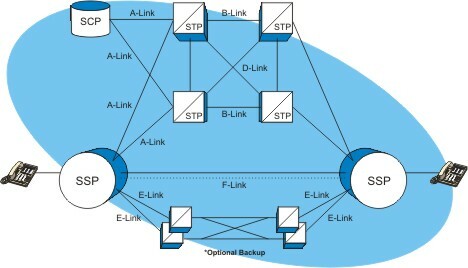 Extended links (E-links) are optionally used to provide backup connections from an EO to the SS7 network. Fully associated links (F-links) share (associate with) the connection between EOs.